The Pleiades are so good at teaching us how to live a beautiful life on this planet, how to love and enjoy life, how to get the most out of our trip here and how to evolve just enough to stay and just enough to not feel stuck here. The world is full of possibility and there is abundance- in this world at this time and it is accessible to us, when we vibrate with abundance possibility, open our inner eyes to see, and can recognize the resonance of our true longing in alignment with that which matches that longing in the world. I still remember the first time I was struck by the beauty of the Pleiades, in a starry night sky above the Appalachian aka Blue Ridge mountains of Georgia in the Southeast USA. There is something alluring and magical about the shape of this spiral constellation to the human eye, and it does have a strong resonance with human beings as the Pleiades have been channelled into books by a number of authors, including the Pleiadian Agenda by astrologer Barbara Hand Clow. Clow in this book describes the bond and connection between the Pleiades and Earth as resulting from a karmic obligation initiated by Pleiadian entities in ancient times on Earth, and this is similar to other channelled work in the sense of the Pleiades being able to have a direct connection with human beings. In many interpretations of Pleiades energy, as in the passage above by Rosie Finn, the Pleiades are described as having an energy that resonates with life on earth for humans and has wise beneficial guidance for how humans can survive and thrive on a higher level on this planet. As in the quote above, this resonance is often described in terms of aligning the desires of Taurus with the thoughts and expressions of Gemini, aligning our minds and bodies so that we are more truly in alignment with what we want to truly manifest in our lives, and being mindful of the vibration we are emanating with our being. According to many authors, the Pleiades hold the belief that we can manifest abundance in our lives through our intention and vibration, as well as communicate with one another instantly and telepathically without the use of cell phones or instant messaging (cell phones and instant messaging serving as signs revealing our actual potential in this case). The Pleiades are also here to help spark and facilitate human evolution according to many of the channelling authors, and so to me this connects them with the Esoteric Astrology development of the sign of Gemini from a subjective mind relating others to self, through a more objective mind that is able to relate the self to others, and ultimately to a wholistic mind that is able to relate the One (Spirit/Source/God) to self and to others, synthesizing “lower” mind issues to serve the “higher” mind (Oken, p. 177). Balanced Characteristics: Responsible, Reliable, Balanced effective will, Warmth in personality, Playfulness, Confidence, Appropriate self-discipline, Able to meet challenges, Sense of one’s personal power. Our perception- even somatic, gut-level perception- has been overlaid with imprints of previous experience, messaging, and sensation. Our physical and energy bodies are repositories of impressions; we are dealing with layers of information when we tune into our body wisdom. To most benefit from what our body can tell us, our work is to sensitize our awareness, refine our recognition of sensations, and then also to cultivate discernment regarding whether the messages reflect something true about the present moment or are an echo of habituated protection, now keeping us from experiencing the next level of intimacy with ourselves . . . For instance, physical intimacy with a new beloved may trigger gut sensations felt as fear, anger, shame, discomfort, anxiety, even panic in someone who was violated by touch in the past . . . Rather than rejecting the current lover, the person with such body memories could choose to use the safety of the present dynamic to first recognize and then explore these stored sensations- and work to heal them with the love energy presenting itself as medicine. “Trusting the gut” in such an instance requires self-awareness, courage, and the willingness to understand one’s experience . . . and allow it to transform. The Third Chakra, the solar plexus, is about fire and transformation. In herbal alchemy, when we yield the plant body to fire after extracting its magic with fluids, the resulting salts in the ash- when returned to the liquid- make the remedy more potent. The fire energy available to us via the solar plexus first of all can serve to illuminate and then incinerate those fears, habits, and beliefs that limit our potential. The chakra’s energy can enhance our ability to skillfully exercise will and personal power- especially in the realm of cultivating our intuitive voice and our ability to stand in our own center, free from the influence of collective trance. This freedom allows our actions and our voice to be guided from our inner authority, our relationship with spirit, our life purpose. It is through the right use of will that we may heal the past and bring vision into form. One thing for certain, however, is that the Pleiades are associated with guidance for humans, as they were used in ancient times for agricultural cycles and for navigation. In fact, although there is some debate upon the origins of the name Pleiades, it very likely came from the word meaning “to sail” because the Pleiades are visible in the Mediterranean night sky from the middle of May until the beginning of November, coinciding with ancient sailing season¹. Furthermore, through myth the Pleiades are associated with navigation and guidance through being the seven daughters of the Titan Atlas, who held the celestial spheres on his shoulders and was the God of Astronomy and navigation. Being the daughters of a Titan links the Pleiades with Uranus in myth at this time of the Pluto-Uranus square- in fact, Uranus is their great-grandfather! In case you don’t remember, Uranus was the Sky God mate of Gaia, the primordial Earth Goddess, who through her fathered the new archetypes of the Titans into the world: six sets of twins. Iapetus was one of the sons of Uranus who later became the father of Atlas, who then became the father of the seven sisters of the Pleiades. Interestingly, Iapetus is also the father of Prometheus- so Prometheus is like the uncle of the Pleiadian sisters. This further mythic connection to another liberating Titan like Prometheus, the archetype of the trickster who brought fire to humans, makes me feel the Pleiades will be more on the side of the shocking yet ultimately liberating and individuating energy of Uranus in Aries during this time of the third Pluto-Uranus square. Since the Pleiades seem to be connected with practices to help humans navigate at a higher level on planet Earth, whatever third chakra healing is required at this time would be wise to put into practice- this could range from needing to ground inside the body and performing relaxation exercises to needing to take greater risks from a warm and heart-centered will-force. There will most likely be deeply destructive and shocking events occurring- I feel the connection of these times with the Pleiades is our need to ride the wave of energy occurring in the moment and focus on the fact we can still manifest abundance and prosperity in our lives through responsible responses to any intense experiences occurring. Maia, the eldest, was the mother of Hermes by Zeus. Sterope was the mother of Oenomaus by Ares. Merope, the youngest,gained the admiration and attention of Orion. In some myths she marries Sisyphus, becomes mortal, and gives birth to several sons. As a result she is sometimes referred to as the “lost Pleiades,” and is associated with the least bright star in the constellation. 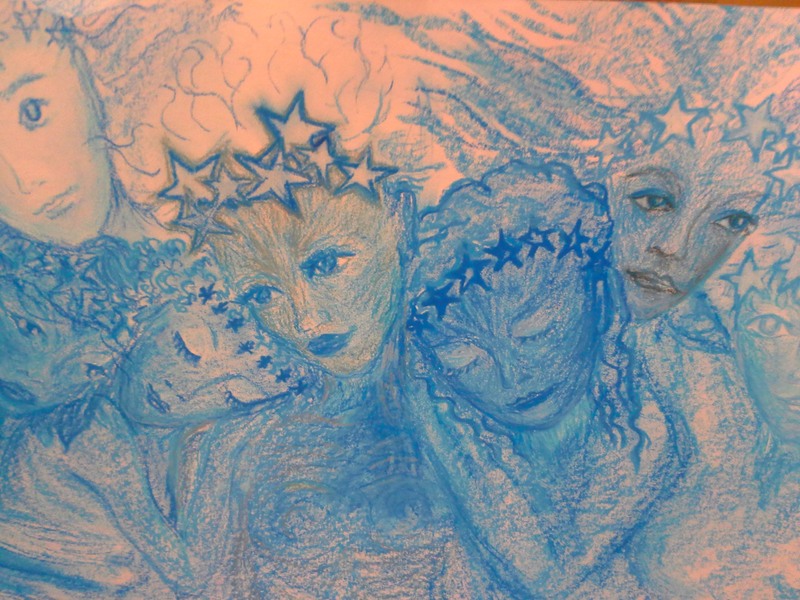 There are many versions in Greek myth of how the seven sisters became stars, but in most of them it is associated with some sort of trauma they experienced as a repercussion of the wars for power amongst ancient deities. To review, Uranus was castrated by his Titan son Cronus (Saturn) who seized power; then Cronus was later taken down by Zeus (Jupiter) who likewise seized the power from his father, and assigned rulerships to his brothers and sisters, including the eldest brother Hades (Pluto), the one currently in a “fight” with Uranus above us today. As a result of the war between the Titans and the Olympians, Zeus took action to ensure that Uranus would not be able to birth more threatening archetypes, so he made the Titan Atlas stand on Earth, or Gaia, and hold aloft the celestial spheres, or Uranus, so that Uranus and Gaia would remain separated. The Pleiades, being the daughters of Atlas, would obviously have been saddened to see their father trapped into this role. In one story, Orion began to chase the Pleiades after their father Atlas was forced to carry the celestial spheres, and so Zeus transformed the sisters into doves, and then into stars in order to appease Atlas. This version has the interesting aspect of Zeus trying to do something nice for Atlas, when Zeus was the one who forced Atlas to carry the weight of the celestial spheres in the first place. This to me is like a political figurehead making overtures to honor the dead or wounded, knowing full well that they were intricately involved in the complicated karmic stew of events that wounded or killed the person in the first place. We certainly are seeing quite a bit of that these days here in the United States of America. And speaking of the United States of America and our governmental “leaders,” Zeus or Jupiter being in the sign of Gemini during this time reminds me of how the U.S. government is not being very subtle recently about it’s shifting into a totalitarian police state in control of all media forms of communication, able to seize the cell phone records or email history of any individual it wants, at any time. Up until now, many of us have been complicit with this- just look around at the vast number of people obsessively plugged into smart phones, tablets, and mobile devices they are literally carrying with them everywhere, all ultimately connected to the same funding sources that are controlling the media and the government. This also goes along with the Gemini Jupiter use of the media by corporate powers hoping to force as much distracting crap on the American populace as possible on television and through all news outlets, hoping people do not realize what is actually happening right now. Although this has been true for a very long time, the rate of this media deception is becoming extraordinarily alarming to me recently. There will most likely be some significant events occurring in this upcoming time period of the Uranus-Pluto square, so hopefully we the people will start taking the responsibility to wake the hell up. Hopefully, the trine between Saturn in Scorpio and Neptune in Pisces will help dissolve the illusions underlying the perceptions and reality we are living, and align us more with the actual truth of our lives, giving us the courage to face the truth of our lives in the process and take accountability for being the change we wish to see in the world around us. But I am getting off my point about how the Pleiades went from being sisters to stars in myth. In the most tragic version I know of, the seven sisters decide to commit suicide because of the deep sadness they were carrying because of the fate forced upon their father Atlas to carry the celestial spheres, or in other variations because of losing their other sisters the Hyades. In this version of the myth, Zeus again decides to honor them by immortalizing them as stars in the sky. I feel this suicide story may be why you will traditionally see some astrologers link the Pleiades with sorrows, misfortunes, and tragedies. However, I do not believe there needs to be such dark energy associated with the meaning of the Pleiades; at most I feel the connection has to do with how we can recover from sorrowful events and cope with our emotions. Because the Greek myths have a clear link between the sorrow of the Pleiades with their father’s involvement in the war between the Titans and Olympians, I feel in particular the Pleiades can help us cope with the trauma of the collective oppression and trauma people around our planet have been subjugated to as a result of world leaders focused upon war, destruction, and manipulating events for gains of global power. When we are facing intense and traumatic times in our collective, if we hope to facilitate and manifest the positive change we want to see happen, we need to be able to keep our own emotions and responses in balance so that we can effectively respond in way that is truly aligned with our inner integrity and authority. These issues are vital to our ability to develop a healthy and balanced use of our Third Chakra, again a chakra likely to be stirred up at this time. Indeed, the Pleiades have a positive life affirming meaning, and have been a significant star focus, for many groups of people around the Earth in addition to the Greeks, in particular with many indigenous cultures. I know I often explore Greek myth in writing since their myths are the basis of the names we commonly associate with planetary archetypes in Western Astrology, but it is at least as fascinating to explore the mythic meaning of the star constellation labeled the Pleiades by the Greeks, through the mythic lens of other cultures (hopefully I will make the time to do so in a subsequent post). The rising of the Pleiades before sunrise was used by many ancient people to mark their calendars, and by many indigenous people as a time telling device. In the Americas, the Aztecs used the Pleiades as a basis for their calendar, and the Hopi built ceremonial spaces in which a hole in the ceiling would reveal the glow of the Pleiades at a specific time to begin a ritual. Interestingly, in many diverse cultures the seven stars have been seen as seven sisters for ages, such as with the aboriginal people of Australia and the Nez Perce of the Northwest USA. I sense such mystery about the Pleiades that I am hoping to center and sense what types of signs, symbols, and events end up being associated with this time period containing so many astrological connections to them. 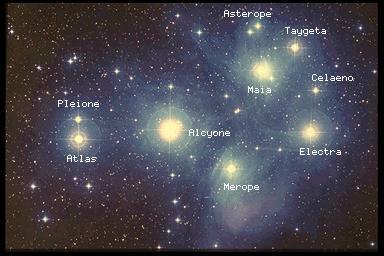 I never knew the Pleiades had overt astrological significance, though I always admired them in the sky. 😉 A very interesting article in light of the seven squares. Yes and no. Which is to say that while you could certainly interpret the Star card as a direct allusion to the Pleiades and I think you’d be correct in recognizing a connection, I’d take a more roundabout method to get there. The Star card is traditionally represented by Aquarius. But numerologically, the Star is numbered 17, which I take as a 7 card, not an 8, because the deck makes *sense* to me in this way — So the Hierophant with the Devil (5), the Lovers with the Tower (6), or in the case of the 7’s, the Chariot with the Star. The Chariot and the Star are cards of creative visualization, unexpected progress and/or direction, and sideways movement. These are also the themes of the 7’s in the Minor Arcana, with the Cups being multiple choices and dreams, the Swords being cutting in line or warping (think old school video games) ahead via “trickery,” the Wands being righteous defense of one’s self and cause (holding ground, do not yield), and the Pentacles being patient evaluation and anticipation of growth (the recognition of a natural rhythm and the commitment to work *with* it). All 5 cards imagine the future before they act, like an athlete visualizing their success before *becoming* that success. I actually think of this as that moment in double dutch before you enter the jump ropes, with your hands in the air measuring the rhythm of the cords and counting in your head. This lines up nicely, to my mind, with the third chakra and the concept of Logos — if you can see it, if you cans speak it, you can become it. But what do you really want to say? The question for all of us would then be: What do we want to say? How do we want to communicate and represent ourselves to one another? And the structured praxis will follow later, after the squares. The Star card doesn’t reveal the outcome. 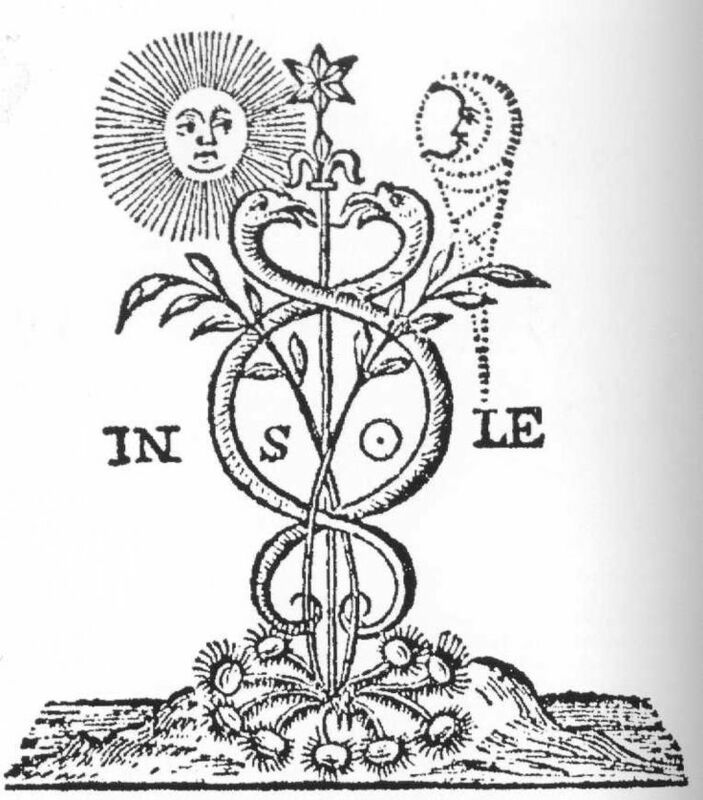 Rather it promises healing provided you pursue a particular course, symbolized by the Star. Thank you for that question, Gray! I hadn’t thought of any of this until I was prodded. Thank You, Kelsey, I admire your analysis of this. 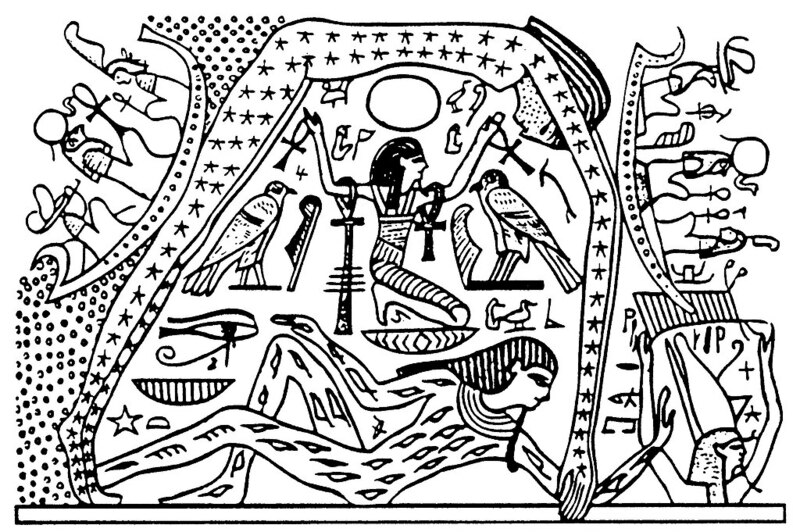 I have not thought of linking the Star with the Chariot before, but I think it is an extraordinary connection as far as intention goes, as far as using the Star as a sort of guidance for the Chariot. Like how you said the Star promises healing provided you follow a particular course connected with the Star, I can also see how this would be a great navigation system for the Chariot, similar in a sense to how the Pleiades served as a navigation guide for ancient sailors. I agree with you that we are not at an outcomes point with this current square, we are only at the beginning of a process, and with this square happening between eclipses, a lot is getting “stirred up” but it isn’t clear what will actually “stick” so to speak. I was just in an astrology group last night and we were talking about this, and our teacher thinks this upcoming Summer with the grand water trine will be more significant than right now to be noticing what is showing up. There will be a grand water trine that is activated by the Uranus-Pluto square. The missing point in Cancer will be hit by personal planets and then this Summer Jupiter will move in to that position, forming a t-square with Pluto and Uranus, but also forming a grand water trine with Neptune in Pisces and Saturn in Scorpio. This can be magical, and we were talking about how we don’t even know really what could happen since Neptune hasn’t been in Pisces before with us knowing about it for so long, and the trine will be very active since it is connected to the Pluto-Uranus square. The synchronicity of this alignment this summer is very amazing. And it will be leading us into the next Pluto-Uranus square this upcoming Fall in the time of Scorpio, which will be connected with the heart and 4th chakra- that one will be a very intense one. Then at the end of the year, as Neptune leaves the grand water trine, Chiron steps in, and we will have a grand water trine with Chiron in Pisces, Saturn in Scorpio, and Jupiter in Cancer! My first house is Cancer and I can *feel* that current stellium in my 12th. My dreams have been labor! And they are unbelievably vivid. With that said, I feel a bit like a bird fluttering around in a cage. Those water trines sound great! I also pay particular attention to Chiron and the True Node — they’ve helped to explain me to myself. Hi Kelsey, that is very very cool, how the relationships between the cards works out when you do that…….I have never come across this before. Where did you learn that? Regardless, I love what the pairs suggest about the importance of understanding that polarities are the co-developers of any successful deepening, and the 2 triplets…….their obvious relationship can be seen at first blush, but I’m sure I will be digging deeper with what they suggest. Do you have a reference to any discussion for these alliances/progressions? It was a technique that I picked up as a kid. I actually don’t have a reference for it, particularly since most people will add the double digits to arrive at a ‘significant number.’ That doesn’t really work for me though, whereas the use of the last number absolutely does. I have a Tarot blog and use the method there, but I haven’t read a Tarot book since adolescence. I find journaling is more effective for meanings and combos. Hope the technique is useful to you! It certainly has been for me. This post is well…just amazing and brilliant. Not only in content but context. What a great writer you are. I am really overwhelmed and at an intelligible loss of words to describe the resonance and synchronicity I felt with you and from this particular sharing. I am just awestruck by you. Maybe with some time and thought I can properly illiterate the ways you and the post are connected to me, or rather, my being. Much gratitude to you and your shinning brilliance. Gray, just curious where is the Pleiades artifact on top is from? Is it Sumerian? 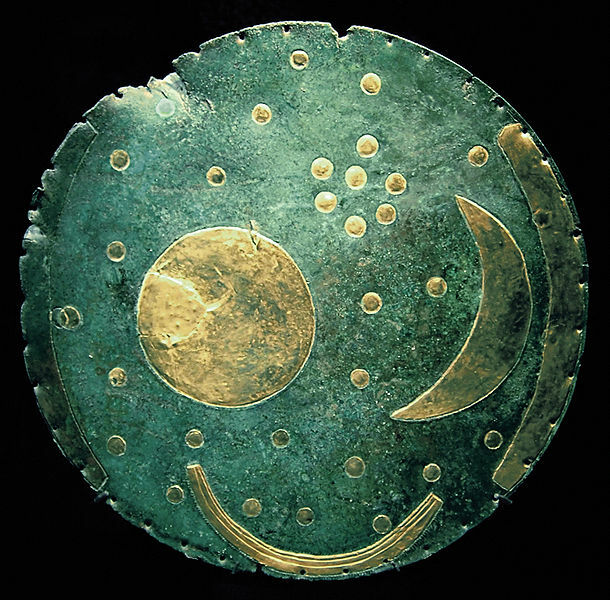 The Nebra Sky Disk is from Germany around 1600 BC. The Pleiades are in between a crescent moon and a sun or full moon, and it has also been suggested it may be depicting an eclipse between the sun and the moon. this is from Wikipedia: The disk is possibly an astronomical instrument as well as an item of religious significance. The blue-green patina of the bronze may have been an intentional part of the original artifact. If authentic, the find reconfirms that the astronomical knowledge and abilities of the people of the European Bronze Age included close observation of the yearly course of the Sun, and the angle between its rising and setting points at summer and winter solstice. While much older earthworks and megalithic astronomical complexes such as the Goseck circle or Stonehenge had already been used to mark the solstices, the disk is the oldest known “portable instrument” to allow such measurements. Another view is that the Nebra disk can be linked to the solar calendar reconstructed by Alexander Thom from his analysis of standing stone alignments in Britain.MacKie has argued that several aspects of the disk support this view, following up the work of Prof. Wolfhard Schlosser.The first is that the Mittelberg – the hill on which the disk is supposed to have been found – is so situated that when the sun sets at two distant mountain peaks in the north-west, both midsummer and May Day are accurately marked (and therefore also the old Celtic harvest festival on August 2); these are three important dates in the 16 ‘month’ Thom solar calendar. The second feature is the two golden arcs on either side of the disk which subtend angles of about 82 degrees; this is the angular distance between sunrise and sunset at midsummer and midwinter at the latitude of Mittelberg. This surely implies a detailed knowledge of the yearly solar cycle on the part of the disk’s designer. The third feature is the 32 golden ‘star spots’ on the disk. Although Thom found really clear evidence for only sixteen subdivisions of the solar year (of 21 or 22 days) in the standing stone alignments, there were some indications of a further subdivision into 32 parts of 10 or 11 days. Re. 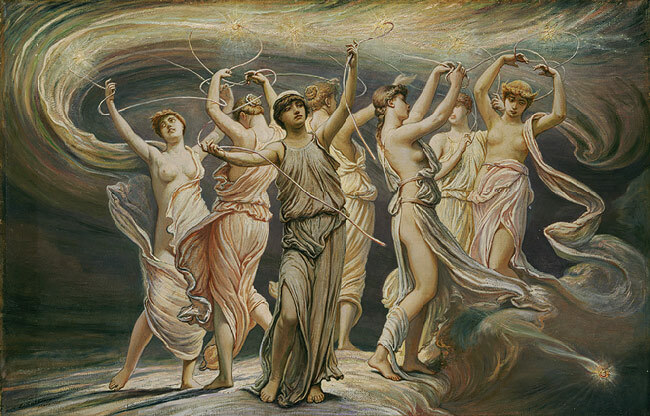 the Pleiades….I tried to find this piece a few weeks ago, but misspelled it, and couldn’t find it. Funny….it came up when I googled esoteric rulers this morning. The web! My first thought when you mentioned authors who have channeled The Pleiades was PL Travers. I loved and read all her books when I was about 7. About 7 is when the world around me shut me down as far as being open to how connected I was to “out there”. She, and many authors since then have, in their different ways, kept awareness alive. When you wrote this, the movie Saving Mr.Banks had not yet come out. I had no idea her father was an alkie, but this post, and that movie, have certainly bolstered my intuition that many many alcoholics/addicts, and the children of, are guided by The Pleiades. You touch on this idea, I think, when you talk about Prometheus. To me, Prometheus, who could withstand having a piece of his liver pecked out everyday, is very much about rebelling against what the gods sometimes selfishly dictate and against the status quo, which is what accompanies a great deal of substance abuse; he keeps the spirit of human free will and warmth alive, no matter what the cost, which, in my mind, corresponds to why at least 10% of the population will always be genetically programmed to be interested in substance use as a way of seeing/freeing (no matter what the cost); and the implied regeneration of the liver….the organ which is intimately tied to the will and the third chakra…is allied with the hope of recovery from substance abuse. which is a difficult process if you are an addict. In AA, Grace is often talked about in the rooms. The emanations from the Pleiades, like so much angelic or light being emanating, is surely quite connected to the experience of Grace. I think maybe you are often able to convey that same quality/hope/open door to transformation in the way you write and think in this blog. When I smoked cigarettes (and drank and did other substances…a long time ago now), each time I used fire to light my cigarette, I would think of Prometheus (as you do!). I used to think what shame it was that I, as a representative of the Collective, had to resort to such a destructive guaranteed daily contact with Fire. Must have been a Vestal Virgin in a past life! On a more serious note, I think you are right about The Pleiades being connected to Collective trauma in the ways you have mentioned above, and I also DO think that they are to be seen as intimately involved and caring re. sorrow, misfortune, tragedy and suicide….substance abuse and how that plays out in individual’s lives, the families those individuals are members of, and the Collective relationship to what these addictions are expressing, and how we look or don’t look, are part of the Collective trauma perpetuated by the war machine. As you indulged in a bit of a side bar on American politics, I would like to also digress into a little rant about the President of this Land of Liberty. He IS connected to The Pleiades (his half sister’s name is Maia, his mother was a Gemini, her parents were alkies. He is a Uranian individual AT HEART, I am so so sad he has lost his way in this role he chose to step into. A choice he made by choosing a fork in the road quite a while ago. The boy who read Pablo Neruda and Maya Angelou actually used the most appalling Watergate type, Pentagon issued language of doublespeak the other day with reference to the possibility of troops going into Iraq. I almost cried. In one of pat Walsh’s workshops, she talked about J. W-Green’s model of the 3 stages of the evolution of conscious awareness. El Presidente was definitely in the third substage of the 15% who are sitting in the Individuation stage, wanting things to change. How far he has fallen – for now – this is what can happen when you get disconnected from your tribe (let’s hope the real good he can do is in the future), I do know he really meant it when he delivered the same message as you have penned above, 7 years ago: “help dissolve the illusions underlying the perceptions and reality we are living, and align us more with the actual truth of our lives, giving us the courage to face the truth of our lives in the process and take accountability for being the change we wish to see in the world around us”. But the difficulty of taking these sentiments out of blogs and out of rhetoric into the world of action, where 80% of that world is living a Consensus experience, is tough. I was feeling very disappointed and angry with him over the past week (again)…until I read what you have said in your latest post on the June 2014 Solstice. This is my personal solstice/Grand Square learning: moving away from the paralysis which comes with disappointment,judgment and figure head blaming. I do hope you get round to writing more about The Pleiades, as you have said you would like to. I feel their energy is a balm for the disaffected who want so badly to be living in an environment which is fundamentally informed by healthy spiritual values……Eris, like Uranus, plays an important role….they stir the pot…..but then we need the glue for all the fractured pieces. 7 Sisters……I await your next piece on them to take that thought further. Thank you for sharing so much here. My Moon in astrology is very connected to the Pleiades and I do feel I have a resonance with them more so than other stars . . . You have some interesting thoughts to share regarding them- I received a gift of a book about the Pleiades I hope to read, that includes some cross-cultural depiction, and so I will most likely wait until I have made the time to read that book to write on the Pleiades again. Your comment here is an excellent prod to get me thinking again about what I wrote in this article and how I could further develop ideas regarding the Pleiades. Thank you. Only now can I appreciate your article. I first had to further inform myself on the Pleiades. To understand that it is a part of Taurus. Yet, for some reason I do not see the Pleiades as a bridge to Gemini. It might not matter. Of course, I connect to the third chakra teachings. I take third chakra issues with society and career, as metal. It can be fluid, but when solar plexus issues ‘harden’ the solar plexus can feel like a metal plate. It may take fire to burn it loose. To get in touch with the wisdom of the stomach, and resolve stuck issues. As I type it, I realize that it is exactly what I had to do. I think I am ready for the second half of the article. But, not tonight. Namaste. I loved your post. I’ve been searching a lot recently about the Pleiades meaning, since I have realized that my sun is conjunct to Alcyone. I have always wondered what my may 20th birthday means, being so close to gemini.. and this is something I had never gotten into. I love it. I love the way you interpret the Pleiades meaning, and I will continue to read and research about this conjunction. Astrology never ceases to amaze me.